3.Save with pictures at least 5 pictures in the folder.Use google images. 4. Open Imovie load the pictures into your visual dock. 3. Organize your pictures on the time-line, add sound and voices. Copyright is a set of exclusive rights regulating the use of a particular expression of an idea or information. 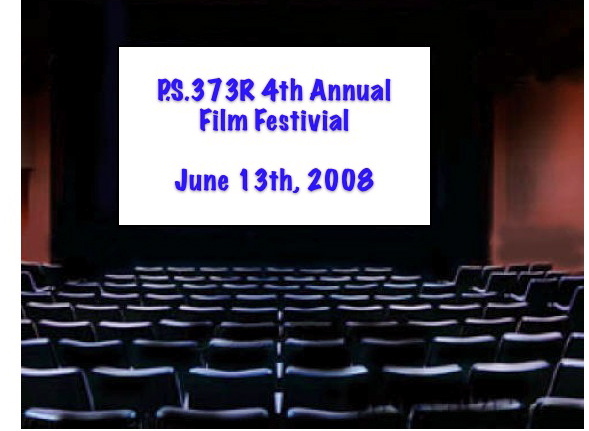 As we approach Movie production season lets spend a few minutes talking about Copyright. Much of the material you access on the Web is copyrighted, meaning you can not use it in your movie or podcast with out express permission or sometimes paying a fee. This includes music, movies, pictures and even written words. Just because you can access it on the web does not mean you have the right to use it. Many songs, movies and pictures are in the public domain. When we say something is in the public domain we mean they can be used with out fee or permission. One great site for public domain photographs is Pics 4 learning . Go to this link and checkout some of the many categories with thousand of pictures. Eli Manning, left, with Michael Strahan.Manning was named the game’s most valuable player. GLENDALE, Ariz. — The Giants were not even supposed to be here, taking an unlikely playoff path through the behemoths of their conference and regarded, once they alighted on Super Bowl XLII, as little more than charming foils for the New England Patriots’ assault on immortality.But with their defense battering this season’s National Football League’s most valuable player, Tom Brady, and Giants quarterback Eli Manning playing more like Brady than Brady himself, the Giants produced one of the greatest upsets in Super Bowl history Sunday night, beating the previously undefeated Patriots, 17-14. The Giants had seemingly been enlivened for the postseason by a 3-point loss to the Patriots in their regular-season finale on Dec. 29, a game in which the Giants had nothing on the line but pride and competitive spirit. A little more than a month later, they topped themselves, winning the franchise’s first championship since the 1991 Super Bowl. Back then, Bill Belichick was the Giants’ defensive coordinator. On Sunday, he was the coach who had led the Patriots to the brink of a historic 19-0 perfect season, had survived a spying scandal that cost him money and his team a first-round draft pick, had weathered whispers in recent days that a previous title might be tainted. But he could only watch as it all collapsed under the weight of the Giants’ ferocious pass rush. For another year, the 1972 Miami Dolphins will stand alone with the only perfect season in N.F.L. history. The Patriots are, in the end, only almost perfect. 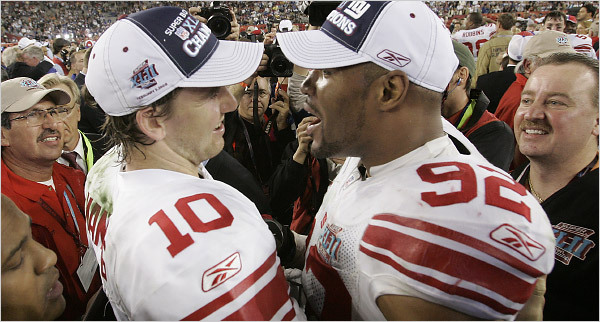 Manning connected with Plaxico Burress for the winning touchdown, a 13-yard pass with 35 seconds remaining in the game. Manning drove the Giants 83 yards in just over two minutes after the Patriots had marched down the field to take a 14-10 lead. Manning was named the Super Bowl most valuable player a year after his older brother Peyton won the same award for the Indianapolis Colts. It was, fittingly, a brutal sack of Brady by Jay Alford with 20 seconds remaining that all but ended the Patriots’ final chance of saving their unblemished record. Brady heaved the ball nearly 80 yards in the air in a desperation shot to reach Randy Moss with 10 seconds left, but the fourth-down pass fell to the ground. So it was Tom Coughlin, who nearly lost his job after last season and was under fire when the Giants began the season 0-2, who was embraced in congratulations by Belichick. And Belichick, either believing the game was over or not wanting to watch it end, left the field, even though the Giants had to run one more perfunctory play to get the last second off the clock. The Giants, who finished 14-6, won 11 games away from home on the way to claiming the Lombardi Trophy. They used wave after wave of blitzes to batter Brady all game, sacking him five times, twice more than he had been sacked in any previous game this season, and grinding the highest-scoring offense in N.F.L. history to a halt for most of the game. Last week, Burress predicted the Giants would win, 23-17. But the Giants, who made the playoffs as a wild card and were underdogs in each of their four postseason games, were even better than Burress imagined. Manning provided the snapshot for the game, pulling away from at least four Patriots and a near-certain sack on third down, and lofting the ball to David Tyree. Tyree made a leaping 32-yard reception, clutching the ball against his helmet as he fell, that put the Giants at the Patriots’ 24-yard line with 59 seconds left in the game. Coughlin said it might have been among the greatest plays in Super Bowl history. A few plays later, Manning lofted a fade pass to Burress in the left corner of the end zone, giving the Giants their winning score. Junior Seau, the Patriots linebacker who at 39 has never won a Super Bowl, lay face down on the ground in distress. After the game, Burress, whose knee had bothered him during the week, wept on national television. Not exactly. The Patriots still have a 16-0 regular season to cling to, and their offense, for almost the whole season, was unstoppable. But they were crestfallen by their near miss with football history. It was the first time Belichick had lost a Super Bowl for New England. In recent days, questions had been raised about whether the Patriots videotaped a walk-through by St. Louis before New England won its first Super Bowl in 2002, and several Rams players said they hoped the N.F.L. would conduct a full investigation. The Patriots now face a long, perhaps embarrassing off-season. And despite his affection for the Giants’ organization, where he worked for 12 years, Belichick was clipped in his postgame comments. The Giants broke open the game with 11 minutes 5 seconds remaining after there had been no scoring since the first two drives. But with Manning’s 45-yard pass to the rookie tight end Kevin Boss and perfect strike in the back of the end zone to Tyree, the Giants seized the lead, 10-7, for the first time since their opening drive ended with a field goal. For most of the game, the score notwithstanding, the Giants had done everything they hoped to do. They kept the ball out of the Patriots’ hands with a long clock-eating drive that wore out the defense to start the game, and blitzed Brady relentlessly. For much of the game, the Patriots’ defense matched that of the Giants. After the Giants took their 10-7 lead, they struggled for the first time to stop the Patriots, who finally conjured the sort of quick-strike drive that defined their season. Brady, who may have been hampered by his injured right ankle, found Moss with a third-down touchdown pass to briefly retake the lead with 2:42 remaining. “We usually are on the better side of those 3-point wins,” Brady said, referring to the Patriots’ three Super Bowl victories, all by 3 points. But at this Super Bowl, another quarterback played the leading man. Manning has been criticized and scrutinized since the Giants pulled off a draft-day trade for him four seasons ago. Last year, he cheered for his brother as the Colts won the Super Bowl. On Sunday, Peyton Manning stood in a luxury box, anxiously watching his little brother complete 19 of 34 passes for two touchdowns. Across the field, Brady, who was 29 of 48 for 266 yards and a touchdown, watched as his season, and history, were buried under the red and blue confetti that rained down on the Giants.